The building now occupied by K.Y. 's has a long and rich history in Slidell. Built in 1902, it was originally the home to Marguerite McDaniels Millinery Store. In 1910 Italian immigrant Andrea Carollo purchased the site for use as both his home and family business, "Carollo's Grocery". The Carollo family operated the store until 1965. In the late 60's Johnny Krolak purchased the building where, for the next 23 years, he operated Slidell Bicycle and Lawnmower Shop. K.Y. 's Olde Towne Bicycle Shop began operation on this site on May 2, 1992. K.Y. 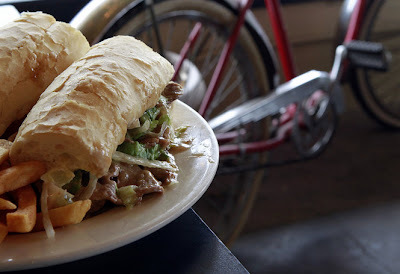 's offers casual dining featuring fresh Louisiana seafood, Po-Boys, Specialty Plates and, of course, the incomparable K.Y. Burger.